Some notes from my first visit to Muslim-majority countries. • The adhan, the call to prayer, is given over loudspeakers five times a day. I confess that I did not find it aesthetically pleasing, especially when you’re in an area with lots of mosques and there’s a great cacophony of competing adhans. But even on its own the chant seems the opposite of tuneful. I really think the muezzins could mix it up a bit. • The Friday noon prayer is the most important one, the one at which the imam gives a sermon. I did not get to witness this from inside a mosque but I did stop for tea down the street from a mosque in Cairo while the sermon was going on. I knew this because the sermon was being broadcast over the same speakers that issue the adhan. 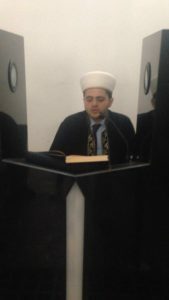 I could not understand it but the imam sounded very emphatic and angry. Afterwards, the cafe filled up with men and boys coming out of the service. • It seems that it’s not enough to read the Koran, you have to listen to it. The Turkish airways inflight entertainment system on the way over featured a Koran option, which you could listen to with subtitles in the language of your choice. The television in my hotel room in Istanbul featured several channels broadcasting the Koran. Businesses would often have televisions on and turned to such channels, and taxi drivers would have it on their radios as they drove around. You’ll know it’s the Koran because it’s not just being read, but chanted, by a reciter known as a qari. You can listen to several examples of this chanting on YouTube. (It’s somewhat interesting, but like the adhan, not particularly tuneful.) One guy told me that this is how the angel Gabriel actually revealed it to Mohammad, and you have to learn the chanting from someone who learned it from someone who learned it from someone, etc. going all the way back to the Prophet. • It is most meritorious, upon hearing the adhan, to stop what you’re doing, make your way to the nearest mosque, and join your fellow believers in communal prayer. Of course, not everyone is able to do this (it seems that most people who went to prayer were elderly men), and I wonder if the imam doesn’t get pretty lonely at certain times. All the same, you can stop in at the mosque and pray on your own if you can’t make the prescribed time. If you can’t make it to a mosque you can unroll a prayer rug and pray in the direction of Mecca on your own. This is not as meritorious but better than not praying at all. • “Woman in Burqa Condemns Woman in Chador” read a headline in The Onion once, and I must confess that I found female Muslim garb rather confusing. Most Muslim women at least cover their hair with a hijab, although not everyone does, and it did not seem that there was necessarily tension between the two camps (although I’m sure I was missing a lot). But you would think, for example, that high school girls would naturally congregate into two groups based on whether or not they were wearing this most obvious symbol of religious observance. However, in Turkey I saw several groups of high school students taking tours of museums, with about 50% of the girls wearing hijabs, and the other 50% with their long dark hair just flowing out for all the world to see, and it seems that everyone got along; the presence or absence of a headscarf was seemingly irrelevant to social interaction. Outside of this context, many Turkish women went further than the hijab, and would also wear a long, straight dress of a solid color – some went even further and wore a complete niqab (that is, a black cloak-like garment including a face covering with only a slit for the eyes). Do these people talk to each other? • Men do not seem to have a similar sartorial decisions to make, at least not in Turkey. In Egypt a lot of men wear the taqiyah, a knitted skull cap, although fewer than women who wear a hijab. Men can also wear the jellabiya, a long beige dress, sometimes with a turban, but I think this is more cultural than religious. 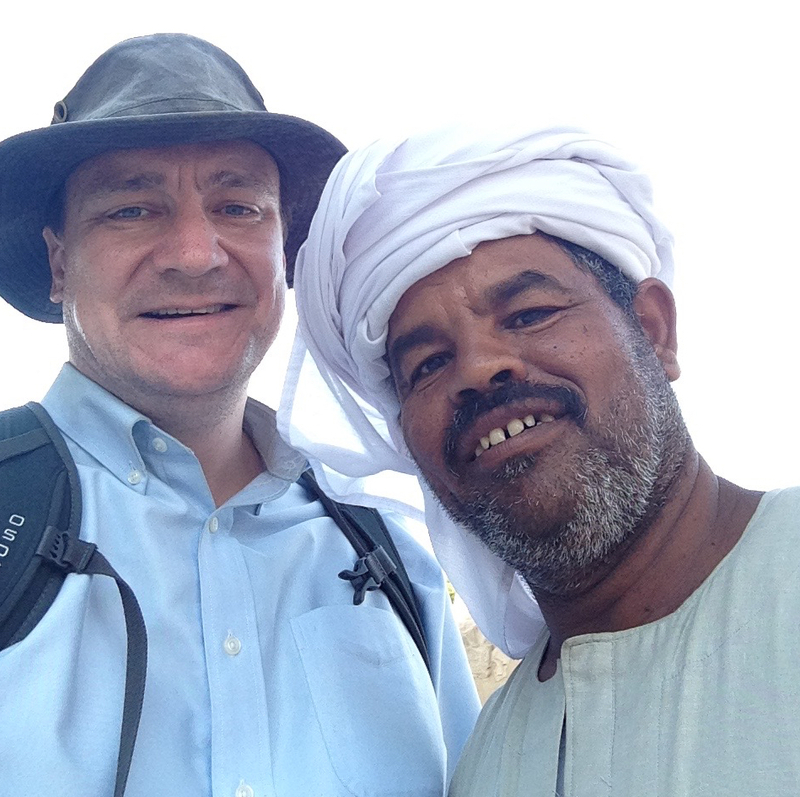 Here I am with Mahmoud, one of the excavators of Karnak Temple, who is wearing this garb. 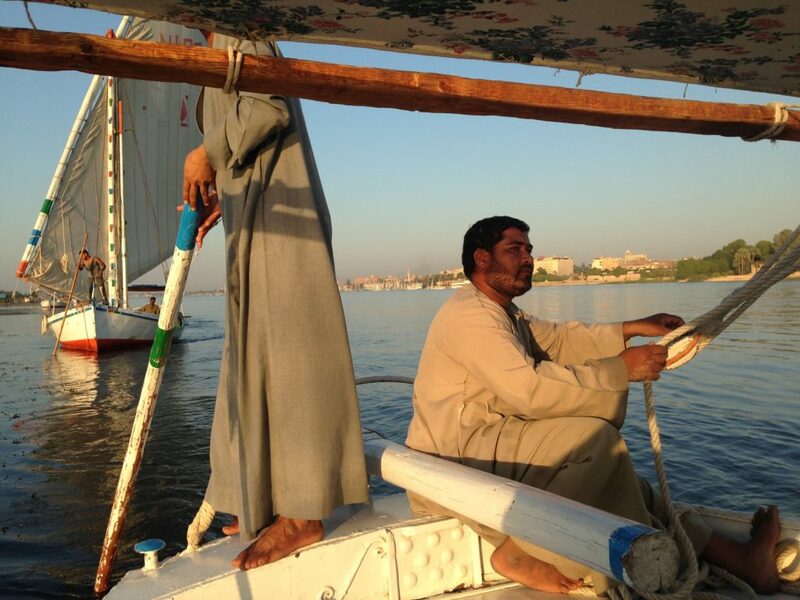 And here is Ahmed (seated) and his standing assistant, my felucca pilots on the Nile and jellabiya wearers. • If there is a male equivalent to the hijab, in Egypt it is the zebiba or prayer bump that appears on one’s forehead as the result of the constant ritual prostrations one must do. I assume it is meritorious to acquire one. • Some of the more popular tourist mosques have banks of pamphlets, and even missionaries, proselytizing for Islam. They take great pride in the purity of their monotheism, as demonstrated by this sectarian propaganda on the Mosque of Omar in Jerusalem. Another thing they take pride in is how Koran 55:20-21 has been vindicated by science. The relevant verses read: “He has made the two bodies of water flow. They will one day meet. Between them is now a barrier; they encroach not one upon the other.” According to a pamphlet I received: “A physical force called surface tension prevents the waters of neighbouring seas from mixing due to the difference in the density of these waters. It is as if a thin wall were between them. This has only very recently been discovered by oceanographers.” So there you go. • Everyone I spoke to insisted that Isis and Al-Qaeda do not represent Islam, and resented people thinking that they do. I was happy to hear this, although one always wonders how situational people are being – and why so many other people do believe that Islam justifies violence…. • To return to Turkey, everyone knows that Erdoğan’s schtick has been to undo some of the compulsory secularism of Kemal Atatürk. A colleague leant me a book entitled Crescent and Star: Turkey Between Two Worlds by American journalist Stephen Kinzer and first published in 2001, on the eve of Erdoğan’s Justice and Development Party coming to power. Kinzer, it seems, had a cautiously positive attitude towards that movement: secularism might be fine as a principle, but when it’s compulsory, it is just as stultifying as any established religion. Why should it be scandalous that a cabinet minister’s wife should wear a headscarf? Why should it be forbidden for a female university student to wear a headscarf? Kinzer, perhaps on account of his own nationality, favored an American-style secularism, whereby no law shall be passed establishing a religion… or prohibiting the free exercise of the same. I do not know if Erdoğan has completely lived up to this promise. I spoke to some people who were appalled by his program – yet his party keeps getting reelected, and has not yet been displaced by a Kemalist coup. So Turkey does seem to be getting more Islamic. A fellow traveler told me that far more women wear the headscarf now than they did twenty years ago. It says something that there’s a Koran channel on the inflight entertainment system on Turkish Air, as does the notice that that their food “is prepared according to Islamic principles.” Such principles do not, for now, prevent the serving of alcohol on Turkish Air, but in Turkey itself beer is now pretty expensive, and served only during limited hours, on account of new laws. (The same fellow traveller told me that a restaurant wouldn’t serve him a beer if he was sitting at a table on the sidewalk, because the Islamists who lived across the street enjoyed spying on and complaining about the place.) I was surprised to see a qari practicing his craft in Topkapı Palace, a state-run museum. 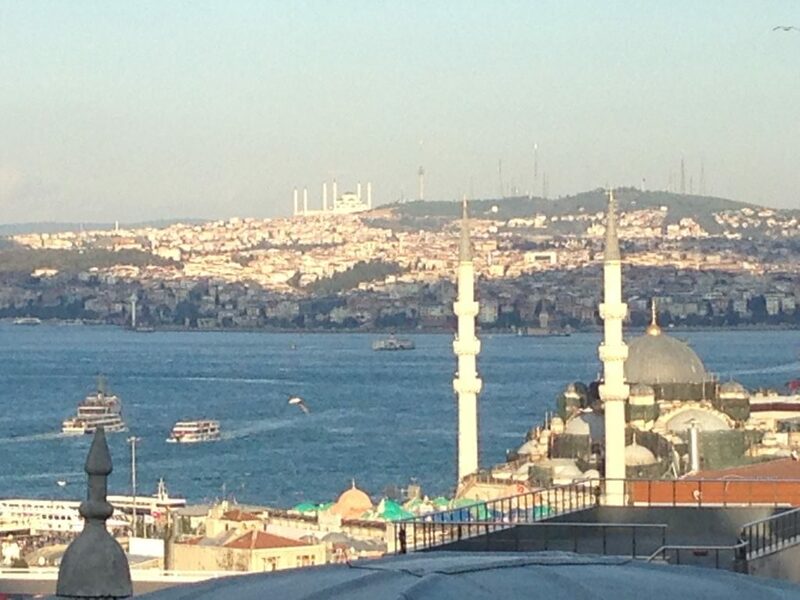 Perhaps most interestingly, Erdoğan has sponsored a mosque-building program throughout Turkey, including an extremely large six-minaret one on the Asian side of the Bosphorus. I believe this is it on the skyline. At its groundbreaking ceremony in 2016, Erdoğan said: “When a donkey dies it leaves behind its saddle, when a man dies he leaves behind his works. We will be remembered for this.” I think he is right. This entry was posted in Islam, Travels by jgood. Bookmark the permalink.